The Cruck Barn Meeting Room at Ty Gwyn Farm01597 829298work Meeting RoomThe 18 Century Cruck Barn is upstairs in the courtyard at Ty Gwyn Farm. It provides an attractive and atmospheric space for meetings, courses, training and events. Fully equipped with powerpoint, projector screen and WiFi. It can be set out in conference style or more informally with comfortable sofas and chairs. The Cruck Barn has a kitchen area for the provision of refreshments. There are two W.Cs. Teas, coffees, light refreshments and meals can be provided. As we are away from the busy bustle of town, peace and quiet prevails and delegates are welcome to walk around the garden and farm for a de-stressing break. The 18 Century Cruck Barn is upstairs in the courtyard at Ty Gwyn Farm. It provides an attractive and atmospheric space for meetings, courses, training and events. Fully equipped with powerpoint, projector screen and WiFi. It can be set out in conference style or more informally with comfortable sofas and chairs. The Cruck Barn has a kitchen area for the provision of refreshments. Access: The Cruck Barn is accessed by stairs, so it may be difficult for people with limited mobility. Please contact us for more information. 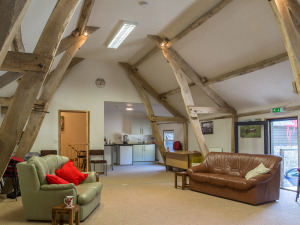 The Cruck Barn is a self contained, purpose built meeting centre. 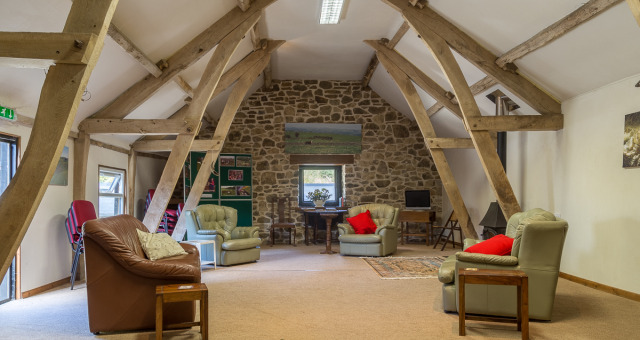 When you need time and space to think, communicate and create ideas, The Cruck Barn provides a sanctuary that will help deliver an effective outcome to meetings, group sessions and social and cultural events. It is well equipped with projector, screen, flip chart and free WiFi. There is a small kitchen and two WCs. We provide teas and coffees, biscuits and cakes and buffet lunches or suppers. The Cruck Barn can be laid out in a formal style or more informally with sofas and armchairs. As we are away from the busy bustle of town, peace and quiet prevails and delegates are welcome to walk around the garden and farm for a de-stressing break. Meeting Room Hire £45 -£80 . Come into Llandrindod Wells, go past the Metropole Hotel (large green hotel on your left), take the first turning left past the Metropole, signposted The Lake. Almost as soon as your turn left, turn right between the chemists and the Automobile Palace. Follow that road out past the lake to a T junction. Turn left, go up hill past golf course, round bad bend, past bungalows on your left, keep going for about 1/4 mile and then follow the road as it bends sharply to the right (do not take the road in front which has a no through road sign). Look for the finger post that says Ty Gwyn Farm. Follow the lane and go through a metal gate (normally open), down the hill to a black gate, turn in just through the black gate into the yard. As you come into Llandrindod Wells you pass the garage on your right, then you come to a wide right hand turn opposite the Old Grosvenor Bakery signposted The Lake and Golf Course. Take that right turn and go out past the lake and up hill past golf course, round bad bend, past bungalows on your left, keep going for about 1/4 mile and then follow the road as it bends sharply to the right (do not take the road in front which has a no through road sign). Look for the finger post that says Ty Gwyn Farm. Follow the lane and go through a metal gate,(normally open) down the hill to a black gate, turn in just through the black gate into the yard.